Venue : at Scania Siam Headquarter Office. 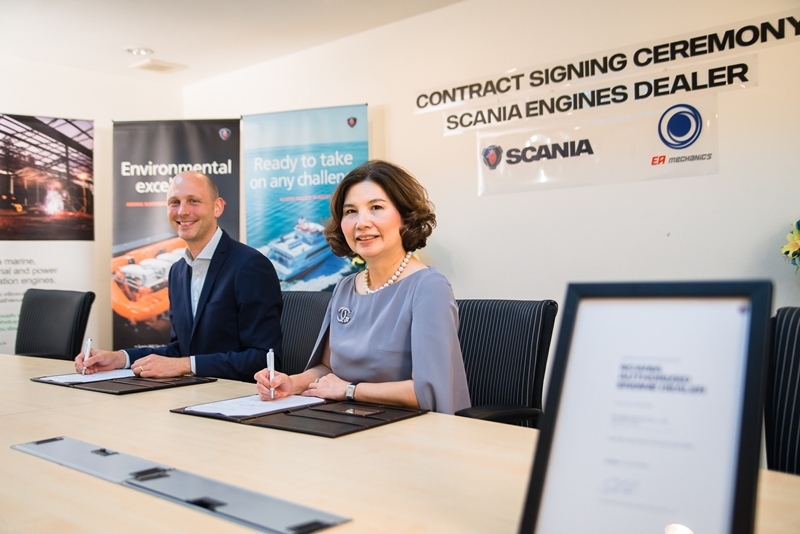 8th August 2017 – Mr.Stefan Dorski, Managing Director of Scania Siam (Thailand) Co., Ltd. and Mrs.Waraporn Trivittayanulak, Chief Financial Officer of EA Mechanics Co., Ltd. signed the business collaborating agreement in which together agree in principle of working together to evolve diesel engine markets for Maritime and Industrials in Thailand and ASEAN Economic Community (AEC) at Scania Siam Headquarter Office. Developing both Thailand and ASEAN Economic Community (AEC) are now trending and more worthwhile than before. Many investors are looking for investing their own business in Asia. Owing to the strong support from government, many Thai companies are able to be successful in an international market. “Scania is a world leading provider of transport solutions. More than 100 years of experiences in bus and truck operation, Scania helps solve today’s urban mobility challenges. Besides, Scania sells engines for marine and industrial including power generation (Scania Gen-set) for land base projects. Every Scania engines have been guaranteed in terms of their robust system and user-friendly functions (modular system) from national standard qualities. This is a good opportunity to serve quality engines from Swedish to Maritime and Industrial in Thailand and ASEAN Economic Community (AEC) stage.”, Mrs.Waraporn Trivittayanulak, Chief Financial Officer of EA Mechanics Co., Ltd. said. EA Mechanics Co., Ltd. experiences in Maritime and Industrial, used to provide quality engines and service to the customers in Thailand. Our Sales and Engineering team also have an in-depth knowledge in diesel engine system as well as strong customer loyalty. This year, EA Mechanics’ management aims to promote Scania to investors and government in both Thailand and ASEAN Economic Community (AEC). Moreover, we would definitely increase sales volume and pursue sales frontline services with an emphasis on customer care and improving customers’ brand experience with the purpose of becoming a brand that creates special bonds with customers. EA Mechanics Co., Ltd. has selected diesel engines for industrial applications range from 275 to 770 HP, 220 to 1200 HP for Marine diesel engines and 250 to 770 kVA for power generation (Scania Gen-set) provided with aftersales services. Both maintenance and service quality parts are also included in order to make a stronger relation between the company and existing customers and create new targets. The collaboration between EA Mechanics Co., Ltd. and Scania Siam Co., Ltd. is confidently support and push up Scania to gain more recognition in both Thailand and ASEAN Economic Community (AEC) industry. This is such a great honor to take part in stimulating Thailand’s economic growth. EA Mechanics Co., Ltd. is the sole distributor of Scania brand. We have committed to providing the best leading for engines, parts and other several other ranges of services and maintenance by highly trained engineers with product consultants to give exact information to match customer’s expectation and satisfaction.